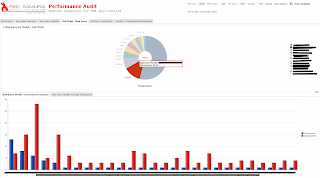 New major release for our Red Samurai Performance Audit Tool is published early this week. Current update contains many new graphs, providing lots of insight statistics for ADF BC performance and user access. We are using this tool in every project we run, this really helps to optimize ADF BC and overall ADF application performance. Little bit about history of this tool. First release was developed in August, 2012 - Red Samurai Performance Audit Tool - Runtime Diagnosis for ADF Applications. There was update v 1.1 published this year, just before OOW - Red Samurai Performance Audit Tool - OOW 2013 release (v 1.1). Update v 1.1 included such statistical information as overall transactions and queries going through ADF BC, as well as user access. It was great to apply the Audit tool today in our project. After quick and easy setup we performed series of tests and identified project's pitfalls for improvement. Thank you! where and how to get trial version of this tool? This tool is available for red samurai customers only, or prospective customers. You can contact me by email, for more details. We don't have plans to have it public. We keep it free, but only to existing or customers or people who would describe performance problem in their application and prove they really need such audit.